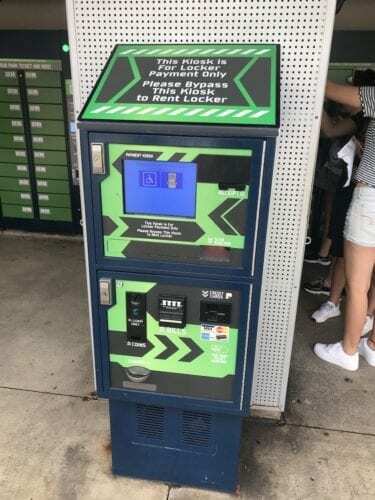 Universal Orlando has changed up their locker system once again, rolling out new lockers and some locker charges at both parks. 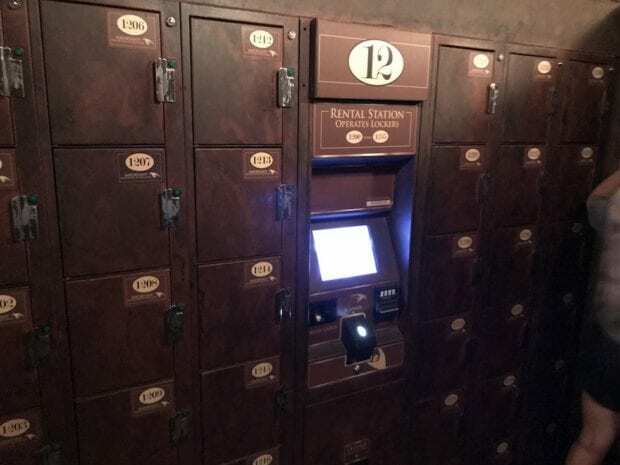 New lockers, free and paid, can now be found throughout Universal Orlando Resort. These new lockers can be found at Hollywood Rip Ride Rockit, Revenge of the Mummy, Men In Black: Alien Attack, Harry Potter and the Escape from Gringotts and Dudley Do-Right’s Ripsaw Falls. The updated lockers come in two sizes: small and large. Most of these attractions do not allow you to bring your items on the ride. Small lockers are complimentary to use for two hours, and guests can reopen them as many times as they want in that timeframe. A look inside a small-sized locker. The small lockers are not very tall, but are quite deep. You can fit an interactive wand or a small bag inside; if you have a souvenir cup, you’ll have to pour out or finish your beverage before stashing it in the locker on its side. A look at a section of the updated large-sized lockers. Large lockers are $2 per rental and are recommended if you’re carrying anything more than a purse or small backpack. These lockers can fit large bags inside, as well as popcorn buckets and souvenir cups without having to empty out your theme park treats. The locker rentals are timed so you can keep your items stored as you make your way through each attraction’s queue. The locker system can also give you an extra cushion of time if your chosen ride’s wait time suddenly skyrockets while you’re in the queue. If you want to add more time to your rental, there is an additional cost. 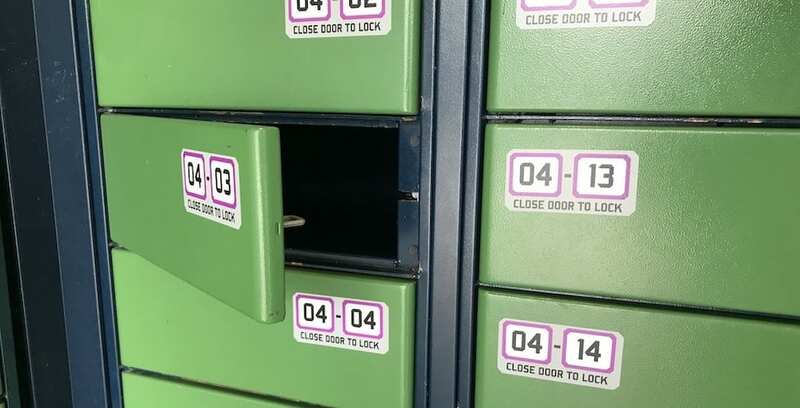 As we previously reported, these new lockers have sensors inside, which will keep note of any items inside the locker and prevent them from being re-rented with guest items still being stored. 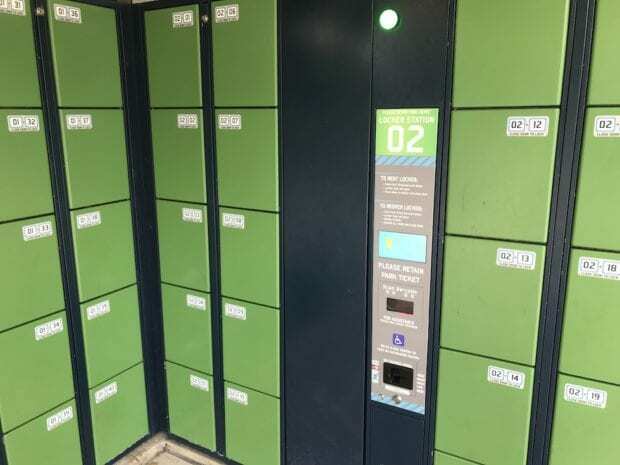 In order to rent out these new lockers, you’ll have to scan your park ticket at a nearby kiosk, rather than scanning your fingerprint. If you used a mobile ticket to enter the park, you’ll have to get a locker attendant to scan it for you; the locker kiosks cannot scan mobile tickets. Conveniently, guests can have rented lockers at different attractions at the same time. However, you can’t rent more than one locker at the same attraction at one time. The kiosk will instead remind you of your locker number in that area and prompt you to return to it. Most of Universal Orlando’s water attractions have not received the new lockers, save for Dudley Do-Right’s Ripsaw Falls. This flume ride has the new, updated lockers, but does not share the same pricing as that of its counterparts. Lockers at Ripsaw Falls, Popeye & Bluto’s Bilge-Rat Barges and Jurassic Park River Adventure cost $4 per rental, with varying time limits. Guests may bring their items with them on these rides, but are advised to use the lockers if they want their items to stay dry. Harry Potter and the Forbidden Journey has yet to receive this locker update, though guests can still store their items for free while they ride. There is no difference in locker sizes at this attraction. If you’re worried about paying to store your purchases in the parks, you should take advantage of Universal’s free package pick-up service, where your items will be delivered to the front of the park. If you’re staying in an on-site hotel, Universal will deliver your purchases to your room or your hotel’s front desk. If shipping your items home is a concern, Universal can take care of that as well. 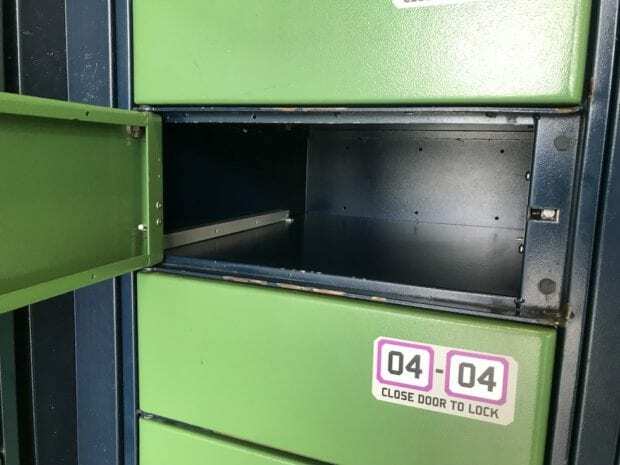 At SeaWorld Orlando, all lockers have a charge associated with them at their major thrill attractions and roller coasters and items are not allowed on the rides. At Walt Disney World, each park has a locker area toward the park’s entrance, but guests are allowed to bring their personal items onboard nearly every attraction. Rides that don’t allow it, like Flight of Passage in Pandora – the World of Avatar at Disney’s Animal Kingdom, have a space to store your items for free. To learn more about Universal Orlando’s other guest conveniences and offerings, visit UniversalOrlando.com.